Dou – collective hanshi wisdom! Many people, who can confidently hit men and kote, continue to have difficulty with dou. This is not surprising, as whilst men and kote are obvious targets that only require you to raise and lower the shinai in a straight line; dou is harder to see and hit. There is some confusion over what part of the dou constitutes the target. Chiba sensei expresses the view, that the whole of the dou plate is a valid striking area. Where the confusion starts is that ippon is rarely given when the front of the dou is hit. The reason however, is not that it is not a correct target, but because posture or hasuji is usually incorrect when contact is made. Having recently been shown dou by both Chiba sensei and Sumi sensei, I was relieved to see that even though their kendo styles and approach to teaching are very different; the key point on dou-uchi made by them both, is absolutely consistent. “Your right hand must be pushed forward so that it is directly in front of you at the point of impact”. This is regardless of which timing and opportunity the attack takes and the direction of your footwork. If we look at the chances to strike dou, we can occasionally make a successful shikake dou attack, this could be as a debana or hikibana technique when your opponent starts to lift his arms to hit men , or as a hikiwaza if he pushes his hands up to counter your downward pressure in tsubazeriai. Dou however, is more likely to be successful as an oji waza; either as nuki or kaeshi dou against a men attack. With nuki-dou, you move your body diagonally to the right to avoid your opponent’s strike whilst at the same time hitting his dou. In this case it is crucial to push your right hand straight forward as you hit, even though your body is moving away from the centre. If you do not do this, you will have to drop your hands and shoulders as you cut across the front of the dou. This will make you lean over to the side and force you to cut down diagonally with bent arms, achieving no power behind the cut. For kaeshi dou against men, you need to block and return the attack in “the timing of one”, whist directly in front of the target. Only after making the strike should you start to move through to your right. One of the points that Sumi sensei makes, is that it is also perfectly acceptable to move through to your left (opponents right), to take zanshin for kaeshi dou. Chiba sensei’s unique spin on dou-uchi is that the path of your cut should be parallel with the floor, so that you strike with the bottom take of the shinai. Whether your preference is for kaeshi or nuki dou, if you move through to the right, you need to either release your left hand or slide it up the tsuka as you move through. You should also keep your eyes on your opponent until you have finished the attack. Freshly inspired by Chiba-sensei’s thoughts on seme, I taught at a pre-grading seminar over the weekend. I made sure that every shikake and oji waza drill we practiced, started from making the appropriate opportunity, either by breaking the opponents centre or by inviting him to attack and taking away the point. Many of the students there visibly bought into the concept that you win in Kendo by creating the opportunity and that the strike is just the completing statement. So far, so good. On the afternoon of the second day, we had the grading and the ikkyu and shodan candidates did a great job of demonstrating their ability. When we got to the 2nd and 3rd dan candidates the pass rate dropped dramatically. The reasons for failure were those I listed in a similar post after the last grading. Mainly people did not pass second and third dan because they did not hit anyone. By hit, I mean strike the target correctly with clear intention and opportunity. Taking it on one level, they did not make opportunities by using seme. Instead they waited for a reasonable interval before rushing in and attacking without breaking the opponents centre or coaxing them out of centre. This resulted in various strikes that missed or at best achieved ai-uchi. This was disappointing because the grading panel needs to see clear evidence that the candidates can stike with correct timing and opportunity before they can put their circles in the box. Most of the failures had been making and taking perfectly good opportunities at the previous day’s seminar, so I can only assume that nerves or adrenalin overdose were the problems on the day. Many senior Japanese instructors talk about the grading requirement as “having done sufficient keiko”, this does not mean turning up twice a week and having fun beating all comers, it means practicing kihon and waza until they become instinctive. So guys, more kihon drills starting from seme and the next examination should be a piece of cake. Experienced kendoka are expected to have a “Tokui waza” It translates as “Unique Technique” , although it is generally thought of as favourite technique. Think of Eiga san’s tsuki and you have the kendo definition of tokui waza. Most strong shiai players have a technique that continually wins their matches; but of course, it is not their only technique. It is the one at which they excel and that which beats their opponent no matter how much it is expected. Tokui waza as a concept, probably came from Judo, where your favourite technique was dictated by your physique. A tall long legged person might excel at uchimata and a short stocky player might prefer seotoshi. There is an element of this in kendo – tall guys favour men, shorter people kote, but there are no rules. I am not sure if I really have a tokui waza. There are two possible candidates at the moment suriage men and kaeshi dou. Both have been equally effective in keiko and shiai, but they work best in different situations against different types of opponent. My own tokui waza have changed over time from hiki men to degote to debana men to the current favourites. How do you develop tokui waza? You need to try as many techniques as possible and find the one that suits you. But there are two serious caveats. Do not try overly complicated waza until your basic ki-ken-tai-ichi and cutting technique is correctly established and do not continually over use any technique with the same people in jigeiko. For example a katsugi men or gyaku dou, every blue moon, may startle the strongest opponent, but try it several times in the same keiko and watch the bored expression on your opponents face. So the answer in my view is to practice new techniques as drills – a few at a time and keep going unti you can do them well. When you feel something really works, try it now and then in keiko against different types of opponent. Another caveat; be careful about using techniques like tsuki on venerable hanshi unless you know them well. When you are comfortable that your tokui waza works and you can make it happen at will, then it’s time to use it to win shiai. I am frequently asked by people in the early stages of their kendo career – “Why do you tell me to cut big when you cut small”. The non diplomatic answer is “because I can and you can’t”. Of course, I am a lot more polite and encouraging than that, but to make successful small attacks, you need good ki-ken-tai-ichi and tenouchi. Thinking about it, ki-ken-tai-ichi is integral to everything we do in kendo and I have talked about it in other posts, but tenouchi is particularly relevant to making small waza work. Personally, I do not have a preference between big and small techniques. I believe that you should have both in your kendo armoury and use them to fit the opportunity. Kote is by definition a small technique as distance is closer than for men and you simply need to lift over your opponent’s chudan to strike. So the choice of big or small techniques is primarily for men. Nuki men is a great example of big technique. You have to lift your hands up above your opponent’s kensen to avoid his attack. Tobikomi men too can benefit from a big furikaburi, lifting your hands above your mengane and taking your kissaki back 45% degrees or so behind your forehead. I find that this works against opponents with strong chudan kamae, particularly if you make the attack with a feeling of sutemi. However whether we are talking about big or small techniques, none of them will work without correct tenouchi and wrist action. If your wrists are flexible, (see my post from July last year on holding the shinai), you should be able to strike men cleanly on top. If your wrists are stiff, either because your kamae is incorrect or because you are gripping the shinai too tightly, the shinai will land at the wrong angle and either strike the mengane or slide off the side of the men. Chiba sensei showed us a great series of drills to overcome this problem. At first, he explained that for speed and flexibility, the cutting motion should be elliptical, with your hands coming down towards the top of your head as you start the downswing. He emphasized that in suburi, bringing the shinai back against your buttocks, as in the illustration above serves two purposes, it acts as a warm up, and it teaches beginners how to find centre. It is not the way to hit men. He demonstrated that the strike should be through to the chin and that the squeeze from the right hand should be just after the hit not on or before. Above all, he stressed that arms shoulders and hands should be free from tension. At his recent UK seminar, he prepared the ground by telling how he practiced 4000 continuous suburi everyday, he then asked everyone to do a mere 200 using an opponents shinai, held at head height as a target. The psychology is simple, people were relieved at having to do only 200, but as this was more than the standard set 20 or 30 they relaxed from the start, saving energy for the last few. The drills moved on through a series of large and small techniques, both shikake and oji waza. By and large even people with particularly stiff kendo were able to be much more flexible and were successful with a far wider range of waza. I think this is the key. If your shoulders, elbows and especially wrists are relaxed enough to do big techniques correctly, then it is equally simple to do small techniques. The choice is simply to find the most appropriate technique for the opportunity. In fact if you do enough kihon practice, the choice should make itself, but that is another subject. With the increase in recent interest in jodan and nitou, tsuki is becoming an important part of the kendo toolkit. Unfortunately, most of us are not particularly good at tsuki. This is probably due to the fact that we do not practise the technique often enough. Reasons for not doing so are plentiful. You are advised not to try if you are a junior or kyu grade. If you are a dan grade holder, it is standard practice not to use tsuki on junior or inexperienced players. On the other hand it is considered disrespectful to try tsuki against a senior teacher, so targets for tsuki in keiko are, depending on your level, limited to kendoka of your own grade and slightly above or below. You also see very little tsuki practice within kihon geiko and of course its use within kakarigeiko is a no no. Even teachers who are experts at tsuki do not always teach it; perhaps they rightly assume that most of us are not to be trusted to use it correctly. Tsuki is certainly my weakest technique, which is logical when I realise that of my total lifetime kendo practice, probably less than 2 or 3 percent has been devoted to tsuki. I have however, in the spirit of better late than never, started to include tsuki in my own kihon practice and I can’t confidently say, teach it, but I include it in basic drills for my students. In terms of technique, there is the choice of kotatetsuki and morotetsuki. The former gives you more reach, but needs work to ensure that you do not compromise your posture and that you keep your body square. Simultaneously pulling your right hand back to your hip as you strike is perhaps the best way to maintain your body line. With two handed tsuki, the challenge is to ensure that you hit with ki-ken-tai ichi and do not just push out with your arms. With either version it is important to make the technique sharp and hit and instantly pull the point of the shinai back. The cardinal sin is to make tsuki as your opponent comes towards you. This is known as mukaetsuki, which is dangerous and regarded as disrespectful. 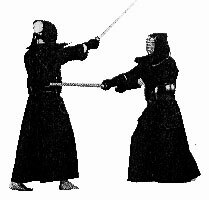 Certainly, tsuki is a valuable technique, not only is it effective against jodan and nitou, but it works against strong chudan, where it is difficult to make a successful men or kote attack. Done correctly it is also a beautiful technique. If you are lucky enough to see Eiga san’s tsuki or that of Arima sensei, I am sure you will agree with me. As most people who practice with me know, I like kaeshi dou. Trying to teach it though, is not a simple matter. To be honest, I have not seen many kendoka below 4th dan attempt is successfully. Dou generally is a difficult technique. Against correct chudan, there is rarely an opportunitiy for tobikomi dou. Hiki dou works if your opponent is intent on covering his or her men; some younger competitors do a good job with gyaku dou, but the most common successful application of dou is as an oji technique; either nuki or kaeshi dou. Make sure that you approach the technique with an attacking mind! Do not wait for your opponent to strike men and then react. Ensure your posture is correct but with your balance just slightly forward. The block and strike should be one smooth, continuous movement. As with all oji waza, make sure the point of your shinai is going forward rather than lifting up and back. Hit dou whilst you are in front of your opponent and then move diagonally for your zanshin, do not hit after you have moved. Keep your left hand in the centre and only break your right hand grip as you move diagonally. Make sure you hit the side of the dou and do not just scrape across the front. Have correct hasuji, the bottom take and string should be at 45% to the dou. Keep correct distance so that you hit with the datotsu bu. All of these elements are important, but in my view, attacking mind is the most significant, pull you opponent in and make him attack in your space and timing. Successful kaeshi dou takes a lot of work, but it is great when it comes off! The picture shows Honda Sotaro former British Coach showing how to finish dou.